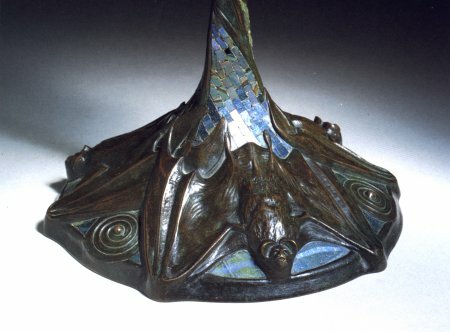 Tiffany Studios, Bat Lamp on rare Mosaic Tile Base, Circa 1900 June 1996 auction of items from the Collection of Roy Warshawsky. The gently domed shade with a band of six bats in flight on the lower border, their bodies in striated puce, slate blue and opalescent glass reserved against a ground in smokey shades of gray, blue, ochre and puce; the base with baluster standard expending to the circular base and cast with three bats, their outspread wings overlapping on the ground set with panels of deepest blue and green mosaic tiles, has finial, rich green brown patina, shade unsigned, base impressed TIFFANY STUDIOS/NEW YORK/760. Height 19 1/4" Diameter 15 1/2". Identified in the Tiffany Studios 1906 price list as "Model no 353, Bat Lamp and shade complete", this exceedingly rare lamp is one of three known examples. According to the family of the original owners, this lamp was a wedding present to their grandparents in 1895, although it is more likely that they purchased it on a trip to the United States in 1905. They were mill owners in Lancashire as well as Liberal politicians. Their business brought them frequently to the United States. The wife was American born, Elizabeth Lawton Coffin, daughter of Esther Bancroft Lawton Coffin (1839-1921) a portrait artist from the Hudson River Valley.